This day long Reiki class is focused on doing Reiki for humans as well as animals. Receive an attunement which allows you to channel Reiki, comprehensive information on the history of Reiki and its origin, an introduction to energy anatomy, how to work with clients, hands-on instruction and practice devoted to giving and receiving a Reiki Level One session, resource lists of traditional medical settings where Reiki is offered and a detailed training manual. Small class size. Potluck lunch. Sign up for Reiki One & Two Class at the same time for a total cost of $295, a $40 savings. Reiki Level Two teaches and empowers the use sacred symbols to focus the healing. Introduce of energy-focusing tools used to expand, protect and break through blockages which enhance and support mental and emotional balance for self and others. Instructions in distance healing will be given – how to use the Reiki symbols to direct energy to heal the past or set the stage for future success. Hands-on instruction and practice devoted to giving and receiving a Reiki Level Two session. You will obtain a detailed training manual and Certificate of completion. What are your turning points? Places in your life something despairing turned to gift. It is a courageous, loving and unconditional act to share the spirit of change. 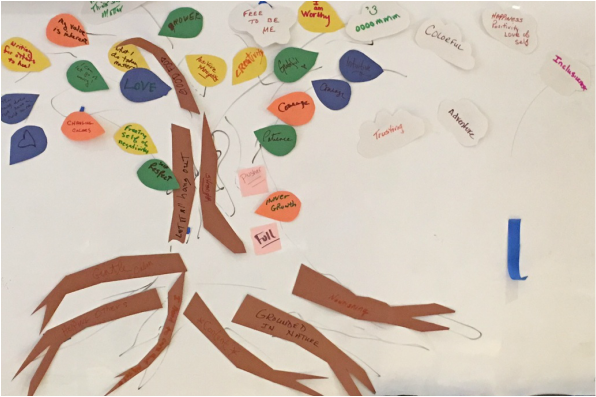 Together we used exercises and play to recognize how we are influenced by our perceptions, truths, and explore ways to nurture the ongoing changing of ourselves and our community with grace.